I tried… But it [food] just won’t go down! I can’t force the food down my throat when after eating a measly 100 grams of cheese, 20 grams of butter and 30 grams of sugar, you have to make a written statement that I did eat all that. It is as if they are collecting these statements like receipts, to bill Ukraine for the “expensive” upkeep of their people’s deputy! Food sticks in your throat when you have to eat under the eye of three prison wardens and a doctor, and three video cameras rolling! And then they bring the scales and weigh you after every meal, as if you’re expected to gain a kilogram after eating 100 grams of food! I cannot stomach Russian food! Even their water and air are poison to me! I’ve become allergic – no-one can say to what, and no-one can cure it. All they can do is shove me with medicines. Maybe I’m allergic to Russia? To prison?! I weigh 50 kg, sugar level 2.8, blood pressure 90×50, temperature 35.8. Please don’t write me letters asking me to live and eat. Hunger is the only weapon I have to fight the lawlessness of Russian authorities. So don’t ask me to lay it down! Free birds cannot live in prison! And in a foreign land, one can die from missing Ukraine alone. She now says she has become allergic. I suppose it is normal for a starving person. So-called gut flora controls a large part of our immune system but, unfortunately, she has not taken food for a very long time. So, her gut flora is damaged and her immune system is very weakened today. 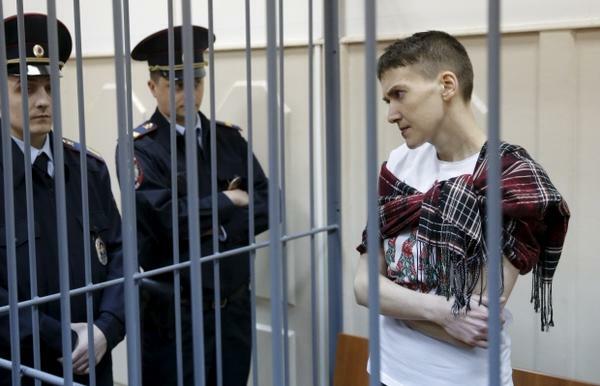 Even today, I wonder if the Ukrainian President is willing to help her by writing an order for her to stop the hunger strike. I wanted the President to do it earlier in order to save the life of his female troop who is kept in a Moscow prison. She needs a very good medical care immediately, in my personal view. Hopefully, the Ukrainian President will make up his mind now. By the way, it has been reported recently that Kim Jong-un, the notorious dictator of North Korea, cancelled his official visit to Moscow for the coming Victory Day ceremony in early May. Also, Alexander Lukashenko, the President of Belarus, reportedly declined to visit Moscow during the same time. Their decisions must have made many people curious. Former Supreme Commander of the NATO, Wesley Clark, already warned that the Kremlin would launch an offensive in early May. Now we see two heads of states decline or cancel their official visits to Moscow for the ceremony of May. I have to wonder if the two heads of states made the decisions not to visit Moscow because they have a good intelligence that the Kremlin would actually start its new invasion around the Victory Day and they did not want to get stuck in Moscow when it is launched. I hope the Ukrainian President will be very cautious this time. I hope the UK and the US will assist Ukraine with very good military intelligence and materials this time as well.